One of my friends shared the above post on their Facebook timeline the other day. I loved the post so much, I started writing a comment replying to my friend about how much I loved it and pretty soon my comment turned into a full-fledged article. So instead of posting the comment on Facebook, I decided to share my thoughts with you all here (you're welcome). When my brother died in December of 2013, I plummeted into a depression deeper and more miserable than anything I had ever experienced before or since. I think it was pretty obvious to everyone who knew me and everyone who lived in close proximity that I was not an extremely happy person, but I think few people realized the full extent of how sad and lonely and depressed I really was. That was my fault. I had no idea how to even begin to explain to anyone what I was going through and it was hard to be honest about my emotions when they were incredibly ugly and painful. I felt incredible shame in the midst of my grief. I felt like I had nothing to offer my friends and family because I was constantly sad and emotionally unstable. I felt conspicuous and uncomfortable around relatively happy people because their happiness only exaggerated my overwhelming sadness. Still, I was really good at hiding it and bottling up. I was good at keeping a stiff upper lip and putting on a smile most days. When depressed, I was often so overwhelmed by my emotions or completely exhausted from them that I found it almost impossible to stay aware of my surroundings. This only exacerbated my sense of uselessness. It also got me into a few car accidents. The weeks immediately following my brother’s death, my family was flooded with the generosity of our community. Friends, relatives, acquaintances, and complete strangers reached out to offer and give us help. The gestures, the meals, the flowers, and the cards helped hold us up in the trying days. Months and years after my brother’s death there were still many people who reached out to us, but as time went on, this list dwindled down. I never expected the bombardment of generosity to continue. In fact, it was relieving when it died down and my family had peace and quiet and room to grieve. In the months and years following my brother's death, my grief intensified. This startled me, but it also made sense. As more time passed, the more I processed the reality of his loss and the more poignant his absence became. During these darkest months, it was not necessarily generosity that I needed most. It was not meals and cards and flowers. What I needed the most was compassion and patience and I was surprised at how little genuine compassion existed in some of the friends and acquaintances closest to me. I don’t want to pit generosity and compassion against one another, as though generosity is somehow a bad thing and compassion is the positive alternative. I think these two work best in tandem. The point I want to make is that a lot of people want to be generous and even more of us want to appear generous. Many people want to be hospitable. They want to give meals. They want to be thoughtful and kind. But…they also expect something in return and when their generosity goes unpraised, unappreciated and un-thanked, they grow hard-hearted and resentful. Depressed people are not nice people. They aren’t good at taking offers of help and they’re even worse at receiving help with appropriate thanks and gratitude. They can be flaky and unreliable. They’re broken and needy and hurting and desperate to feel like they still retain some usefulness and value in spite of their brokenness. They are all too aware and sensitive of the burden they are on the people around them and this often makes them withdraw even more into themselves. In the midst of grief, sometimes it was the offers and attempts to help that hurt the most. I know this sounds ridiculous and very un-Christian (we should be thankful for help, right?) but I can tell you that anyone who has suffered depression has experienced this. The offers of help, the advice, and the kindly meant criticism typically serves to only exaggerate our overly negative views of ourselves. It gives us more fuel to dump on the fire of our self-hatred and self-loathing. It can make us feel more conspicuous and self-conscious and worthless than ever. Sometimes help hurts more than it helps. The people who were ultimately successful in reaching me in my hour of need were not the people who promised to be there for me if I ever needed someone to talk to. The people who reached me were the people who called to talk to me simply to talk to me, the people who wanted to hear my opinion, the people who wanted my advice and company, the people who recognized and acknowledged the likable qualities about me, the people who wanted my presence—not because I needed them—but because they genuinely believed I had something to contribute to them. The people who reached me were not the ones trying to be my friend simply because I was grieving, but the ones who were being my friend simply for me. The people who were successful in reaching me were the ones who didn’t try to force me to open up about my grief, but instead trusted I would share when I was ready. The people who reached me were the ones who showed me compassion and kindness even when I deserved criticism and condemnation. There is a time and a place for criticism and tough love. However, someone who is in the depths of depression is probably already hyper-aware of everything they are doing wrong and all of the ways they are failing. Anyone who has struggled with depression knows that your worst enemy is the accusatory voice screaming in your head telling you you’re not worth it, that you’re nothing but a failure, and that you should just give up. If you really want to reach the depressed, the mentally and emotionally trodden down, and the broken hearted, you have to first let go of your need to be needed and your need to be thanked and praised. We all want to be the generous person. We all want to be the benevolent hero. We all want to make a difference. But Jesus Christ demands more of us. He demands us to lay our rights down and show forgiveness and compassion when it’s not deserved, to be patient and loving even when our good works are received thanklessly or rejected altogether. What is your experience with depression? 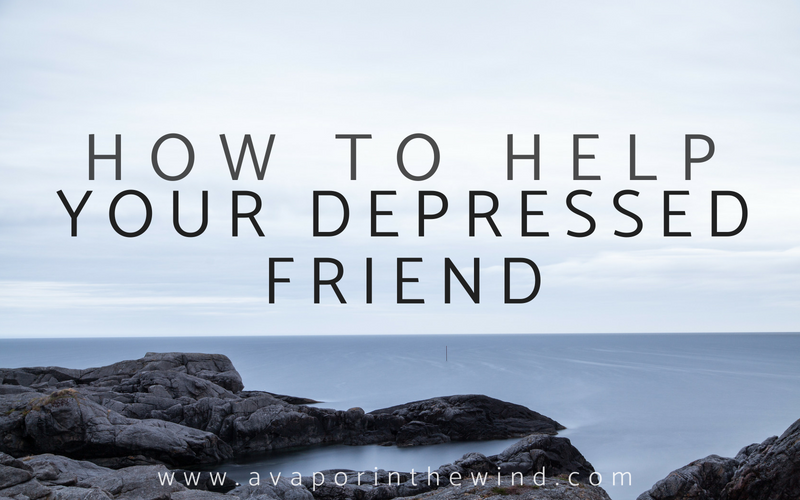 Have you ever struggled to be compassionate toward those suffering from depression? Oh, Dani...just thank you so much for this :) I so appreciate your ability to express your own feelings in such a relatable manner. Much of what you discussed here was what I suffered after my grandma passed away in January. I won't say this was even close to your level of pain after your dear brother died. I went through a very dark quarter where I was simultaneously crushed by grief, class overload, anxiety, depression, and thoughts of suicide. I wish more people had reached out to me. I had no idea how to talk about things most of the time, and there was someone who offered to "be there" for me, but then wouldn't be when I tried to talk to her. I appreciate your thoughts on care and compassion, because everyone's needs are different in times of grief and depression. I think we too often minimize the effect stress can have on us, especially when there is an unspoken expectation that we’re supposed to “handle it” and when we can’t handle it, we feel abnormal and we’re scared to share about how much we’re really struggling. I know articulating my grief and what I was going through was the hardest part for me. Starting this blog was a big lifesaver for me. It let me share about what I was feeling, but in my own time. This blog also helped me reach people who were going through similar struggles. I guess in little ways, God helped show me that He was bringing beauty out of pain. Excellent post Dani, thank you. A lot of this rings true for my experience walking through depression with my dad and also my own experience. Thank you so much! I’m so sorry for the late response. I just now realized I had a back log of comments Blogger failed to notify me about!